This book is an exhaustive treatise on. the concept of Rhythm in Indian music. 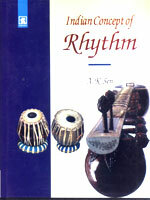 In the first two chapters, the fundamental concepts of Indian music are dealt with comprehensively. The history of Indian music and its phases are dealt with in the first chapter. The second chapter deals with the concept of Tala and its significance. The third and the fourth chapters discuss the place of Tala in Indian classical music. In there chapters the author has dealt with in detail about and every Tala and its variations giving a variety of illustrations folk music. The fifth chapter is a complete treatise on percussion instruments supplemented with relevant photographs. The sixth chapter deals with north Indian and south Indian music. Discussing the salient features of both comparatively and highlighting the differential traits. The seventh chapter and the three subsequent chapters deals with the development of major Talas and scientific concepts of Tala and public taste. Throughout, the book is a harmonious synthesis of scholarly treatment, rational scientific outlook and musical aesthetic experience. The distinctive trait of the book is the meticulousness and insight with which the matter and the illustrations have been collected.